The ADR F760X-R Compex compressor/expander was a favourite dynamics processor during my formative pro-audio career in the early ’80s, and was unique and innovative in that it could limit, compress and expand all at the same time, using a single FET gain-reduction element. Its gating technology was ahead of its time, too, and I loved its fantastic versatility and the broad range of effects it could produce, while its quirky user interface intrigued rather than fazed me. Not surprisingly, the Compex became a mainstay of music production throughout the ’70s and ’80s, and is largely responsible for many of the drum sounds on classic tracks of that era. Original units change hands for big money today, but a new hardware reissue was released last year with a mechanical redesign to overcome the reliability issues associated with original models (www.soundonsound.com/sos/feb14/articles/adr-compex-f760x-rs.htm). As far as I know, however, there hasn’t been a plug-in version of this amazingly versatile compressor until now. The Boz Digital Labs +10dB compressor is available on its own, emulating the F760X Compex, or with a four-band EQ module to exactly replicate the functionality of the ADR F769X-R ‘Vocal Stresser’ variant. 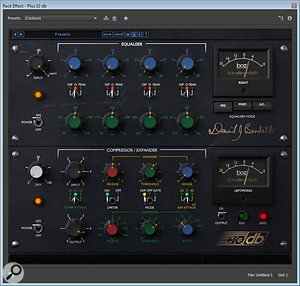 The plug-in algorithms have been modelled very closely on the hardware, and the project was aided by producer and mixer David Bendeth who is an enthusiastic owner of several ADR processors. 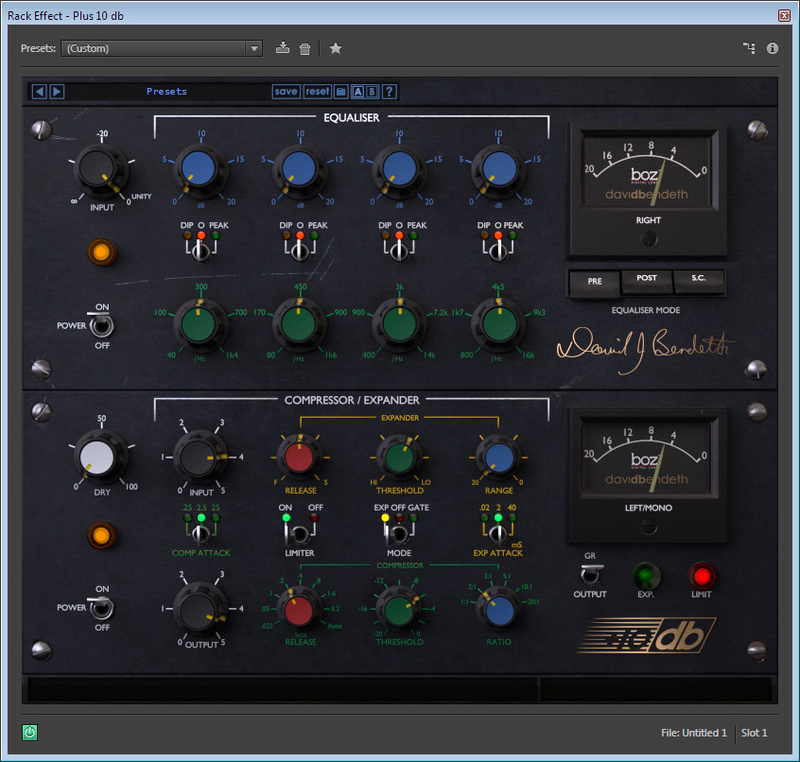 Like most plug-ins, the +10dB compressor comes with a variety of factory presets, the ability to save more, and a very handy comparison feature where the current settings are stored automatically into temporary A or B memories. Boz Digital have made some minor changes from the original, adding a very useful mix control to permit parallel compression within the plug-in itself, but removing the peak limiter’s pre-emphasis mode, which was often used as a very effective de-esser. Other changes are subtle but potentially confusing. The order of the compressor and expander attack-time toggle positions is different (but arguably more logical), and the colour-coding of the knobs has also been changed. ADR always used black for Level, green for Release time-constants, yellow for Threshold, blue for Ratio and red for Range. Boz have used black, red, green, blue and blue, respectively, and while this is obviously irrelevant for novices, it befuddled me! An output level metering option wasn’t provided on the original hardware, but is most welcome here. However, the meter retains a right-hand-zero action, so loud peaks kick the meter down to the left just like the GR mode, which is quite odd! 0dBFS corresponds to 20 on the scale, while -10dBFS is around 8 and -16dBFS is about 4. +10dB Compressor $99; +10dB Equaliser $65; +10dB Bundle $199.